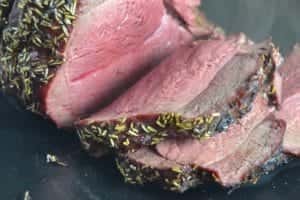 Venison is for great grillings! 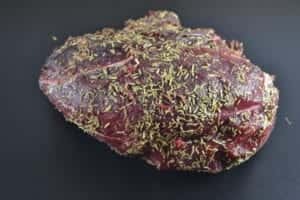 I like the mild taste of venison. Sirloins and tenderloins are great, but so is a good roast. You just have to be careful on temperature control or there is a great chance of getting chewy piece of meat. Low and slow in this case means 220°F (105°C) – 300°F (149°C) and about 1 ½ h grilling time. You can smoke it if you like, but I grilled it this time without smoke. My roast was from the upper back of deer, a top round. It is a lean cut, chewy when raw but softens when grilled with patience. You need to leave it medium rare. If you go far beyond 135°F (57°C), it gets chewy again. This might sound complicated like an open heart surgery, but rest assured it is not. Just relax and keep an eye on your thermometer. I took the roast from the freezer and let it warm up until inner temp was 32°F (0°C). That was enough so I could trim it before seasoning. Some pitmasters like to warm it up to room temp, but I don’t see any benefit on that. Before starting your grill, remove any membrane and hard lumps of fat from the roast. Then season it. For the seasoning I recommend Rosemary, Black pepper and Sea salt. Rub your roast all over and that’s it. My deer roast this time was a 3,3lb (1500g) cut so I was expecting 90min grilling time. I used my Weber Master Touch 22” and lump charcoal. Temperature control would be easier in kamado, but yet I don’t have one. I kept the lower vent fully open and upper vent half open. The roast goes on the other side of the grill grate, whereas hot charcoal go other. This is grilling with indirect heat. It is important especially with venison. If you try direct grilling, you just burn your meat and go to bed unhappy. Once the meat is cooked to target temp, you can finish it by searing on direct heat. That’s what I did, but searing takes only few minutes until all sides have nice color on them. Temperature varied a bit but not too much. 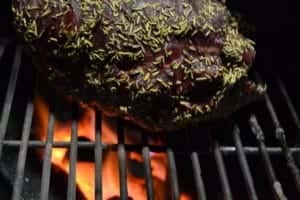 When deer roast inner temp hit 117°F (47°C), I moved it on top of the charcoal for quick searing. I turned it around until I was happy with the color. On 122°F (50°C), I took it off and wrapped in foil for a rest. Temperature carried up to target temp 135°F (57°C) in 15 minutes and end result was beautiful medium rare.